There is nothing like the thrill of discovery. Just like pages in a book, fossil impressions are embedded in 50 million years old layers of shale; when the rock splits and there is fossil inside, many squeal with delight at the discovery. That fossil has never seen the light of day and is certainly something that has not been seen before by human eyes. Finding a fossil takes a bit of patience, yet the odds of finding one are excellent. Everyone in your party must visit the Stonerose Interpretive Center and purchase a site admission sticker. 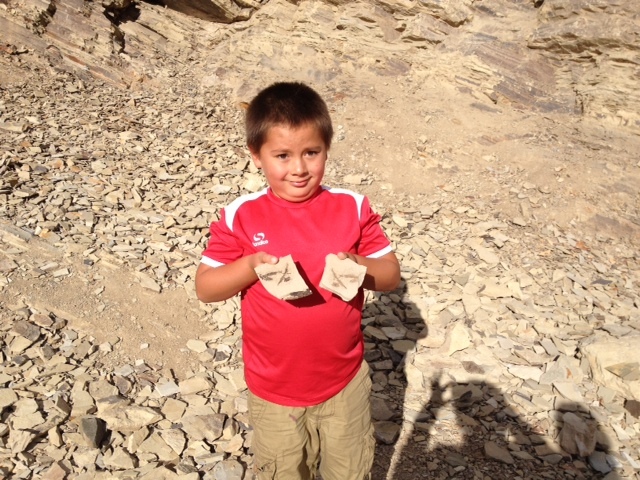 (Fees for hunting fossils at the Boothill Fossil Site). 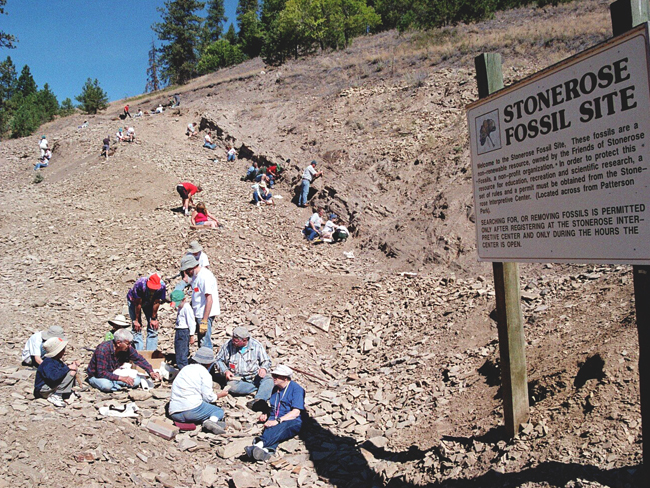 A Stonerose staff member will provide information on how to and where to dig for fossils. Later, they’ll identify the finds and give you a reference sheet with the names of your fossils. You get to keep the three you choose. * In the case where a fossil has never been seen before, paleontologist working at Stonerose will describe, classify and name it. And, when it is published in a scientific journal, the Stonerose digger will be given credit for its discovery! For returning visitors, Since the site is changing from year to year, you must register at the Stonerose center and receive a refresher orientation. The latest that digging must begin is 3 pm, as the fossil site closes at 4 pm. There are Rules that must be followed for your safety and for the continued scientific research that is important for Stonerose. Searching for or removing fossils is permitted only after purchasing a site admission sticker at the Stonerose Interpretive Center and only during the hours the Center is open. All individuals at the fossil site must have an admission sticker with them. All finds are to be brought to the Center for identification by a Stonerose staff member. The Stonerose Interpretive Center reserves the right to retain any fossils that are of scientific value, a new discovery, or significant to the Stonerose collection. Visitors are allowed to take home three fossil pieces per person per day. Commercial use is strictly prohibited. For safety reasons, do not look for fossils in high areas or as instructed by Stonerose staff. The fossil site is within walking distance of the Center. There is handicapped parking at the fossil site only. No motor homes, campers or cars with trailers are allowed. Visitors may rent hammers and cold chisels ($5.00 plus tax) for the day from the Center. You may also bring your own small hand tools to use in splitting apart the layers of rock. A medium 1/2-inch-size cold chisel is best, but people have used old screwdrivers or putty knives. 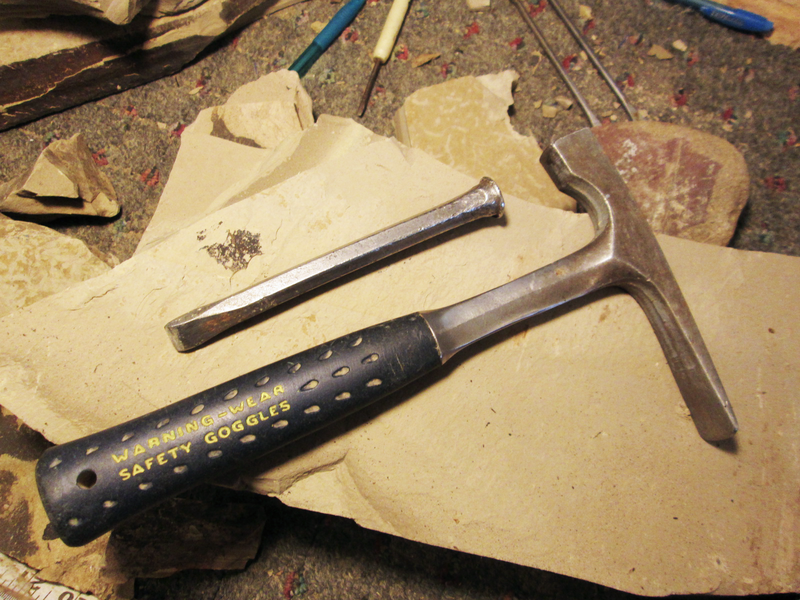 A hammer of any kind can be used to tap on the chisel handle. Power tools are not allowed. We recommend that you wear shoes that offer protection from sharp rocks. Tennis shoes are okay: thongs and sandals are not. We suggest you wear long pants, and bring goggles or sunglasses as protection from flying rock chips and the direct sunlight, and a towel or pad for sitting or kneeling on. We also advise you to bring a hat, and a bottle of water. Water is available for purchase at the site and Center. The Stonerose Interpretive Center is handicapped accessible. There is also handicapped parking at the fossil site, but, depending on your needs, you may need an assistant to help you access the fossil site. 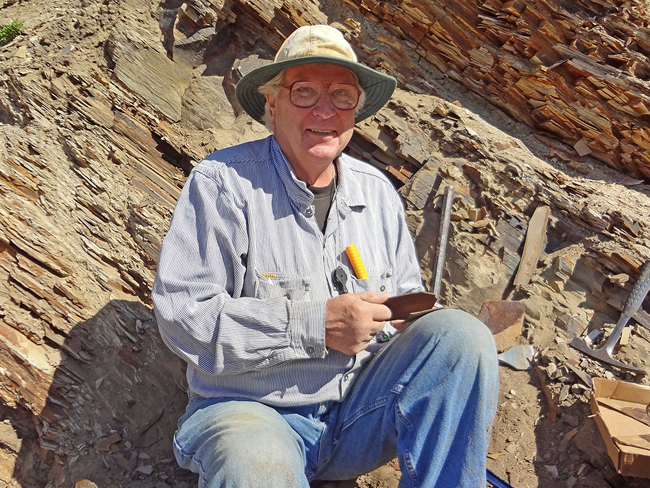 Enjoy the thrill of finding a 50 million-year-old fossil. 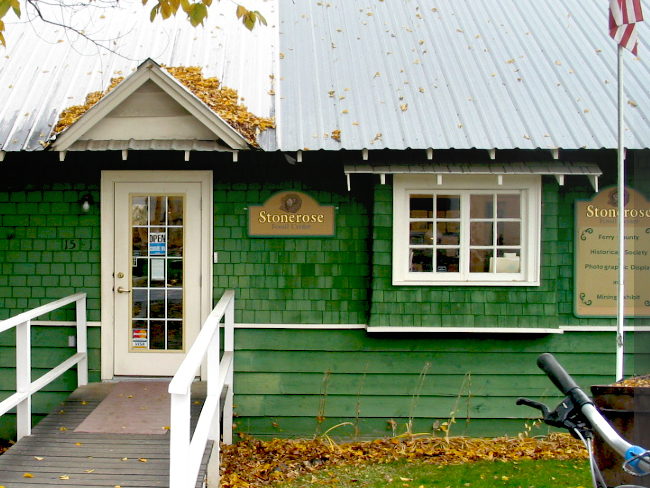 Check in at the Stonerose Interpretive Center and register to go fossil hunting. After you’ve completed registration, head up to Boothill Fossil Site. Bring rock hammers or tile hammers to use or rent tools from us to search for fossils. Bring hats, sunglasses, sun screen, and clothing that shade you from the sun, while fossil hunting.